this can be as simple or complex as you please. Or even a link to something interesting. and as always please stay on topic..
always think of safety before using machinery…! here is the chuck stripped down remember to mark the pieces for orientation..
previously this would have sat in front of the chuck face .needing a centre or steadyrest. Only a small one, or just the spinning chuck part would help a lot. Your milling set up looks very effective. Nothing super clever but I used the super glue trick the other day to thin down some very small parts on the lathe. Was working on a S2+ triple shortie with a 18500 and was really really tight on space. I threw a scrap rod of aluminum in the lathe and faced it, super glued my part to it, hit it with some kicker and was able to cut them down. It was the switch retainer ring and switch/boot spacer. These would be nearly impossible to hold otherwise since they are so thin, and yet I needed to make them even thinner. The retainer ring I was sure the super glue wouldn’t hold due to the small surface area but it held fine. Just hit them with the heat gun to pop them off. Gotta get me a lathe too… Only a small one, or just the spinning chuck part would help a lot. I hope they chime in,. that is a great tip with the superglue I would never have thought of it..
Haven’t got a drill press either.. I usually mess around with drills and and what not. But a lathe head can hold a flashlight tube, a drill can’t (without McGyvering). It took me a long time to figure that one out. It was because of the saying that lathes can make bigger lathes. The flat parts didn’t make sense for me until I realized a vice could be mounted to the carriage, which make the chuck a toolholder, and the lathe becomes a 2 axis horizontal mill. Your implementation is especially nice since the tool is supported at both ends. there are also commercial arrangements available..
Chime Maple block clamped to drill press table with a hack saw blade attached with screws 1 1/4” oc. It helps to scallop the wood for extra clearance before adding the blade. The work is mounted on any conveneient size drill bit that fits in the chuck by wrapping the bit with tape until it’s snug(largest bit with least amount of tape is best). Farther up the bit the flutes end and you have a true cylinder with minimal wobble. It’s critically important that cuts are kept to the barest minimum as the side loading this method causes can cause a tapered chuck to come loose and do some serious harm. I’ve been using the same blade for various projects for over a year now. I used a 5/8” 2-flute bit for this Sipik mod after using a 1/2” bit wrapped with tape and 180w/d to bore it out for a 16mm cell. A drill press? is kind of a “must have”, i found out. even before all this hobby, maybe once a year i needed a drill press, lol. I bought a BIG old one, that seemed pretty good shape. 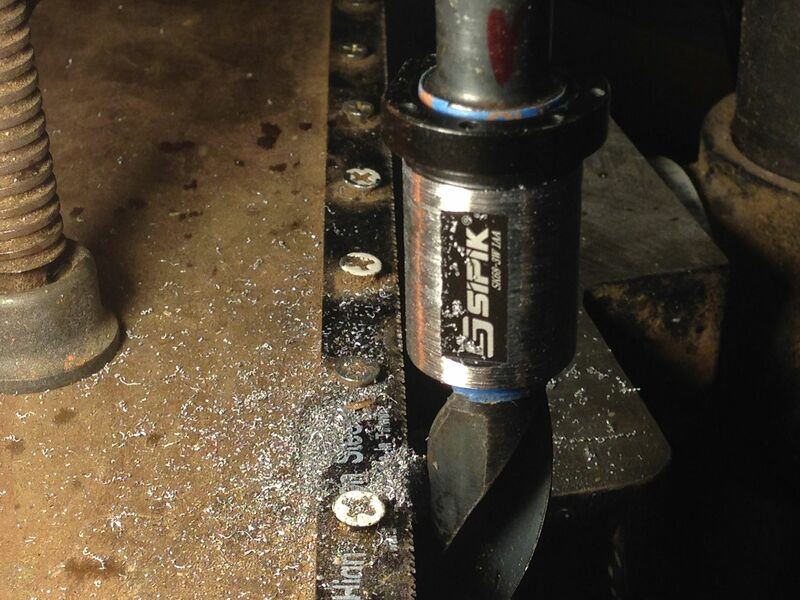 I bolted the biggest “x-y” table harbor freight has to it… and i use it as a “sort of” milling machine. it allowed me to do a few facing and other operations i otherwise could not have done. Various budget HS steel cutting bits from harbor freight? never fail to amaze me, i can actually get a decent surface. in addition to getting a few operations done? It introduced me to machining, and i realized i could use a small lathe, which i eventually bought. Gotta get me a lathe too... Only a small one, or just the spinning chuck part would help a lot. a lathe is nice ,but some of the members here do great work with a drill press and a hacksaw blade I hope they chime in,. scianiac,, that is a great tip with the superglue I would never have thought of it..
And a Dremel... Can't leave out the Dremel. [quote=sedstar]A drill press? is kind of a “must have”, i found out. keen to see some pictures of your setup and work. We have a coupe of those knock off's in the shop at work. They seem to work just as well as the brand Dremel. One of them is a good deal stronger. It came in a kit with a drill press attachment, a small vice, and a snake hand attachment. I may get me one of those myself. It’s about time I accept that I’ve become too much of a machine snob to use my drill press. In the last couple of years, I’ve only used a drill press once, not including training new guys. If there’s any way I can use a mill, I’ll use that as a fancy drill press every time. The best use I can think of for a drill press is as a sacrificial machine for the kind of people we bought $1-3 flashlights to loan to. That said, if you don’t have access to fancier machinery, a drill press can be a very useful tool. I made up an extension handle for the cross slide on the lathe. It is not fixed, I have to slip it on each time to use it. It made it easier to quickly move the slide or in other cases give me that little bit more control. The reason it’s not fixed is it can foul with the ‘carriage hand wheel handle’ at certain points. Nice pp. This is a good thread here with lots of creative novel ideas. Looking forward to seeing and hearing about more. You don’t need fiberglass cloth to play with epoxy, any old T-shirt or rag will do. You can thin it with a few drops of isopropyl alcohol to get thinner layers, reduce bubbles, and soak into the cloth better. nice pp. is that a cut off Vernier for a dro ?. Lol, vernier it is not. It was a cheap set of digital calipers that I modified for the task. Being cheap I’m not worried about it getting swarf and oil all over it. Good for working within cooee and then switch to checking the work with calipers. I made up a handle for the lathe spindle. I don’t have a use for it yet so haven’t put it through it’s paces. It’s made from a 20mm concrete expansion anchor and some other bits and pieces. The first time I use it I’ll get a feel for how tight I need to crank it, and if it can withstand the torque etc… I’m hoping it will slip out easily afterwards but if it doesn’t I have a redesign in mind. Works with Devcon 2-ton, JB weld, and wood restorer. Not my idea but I can vouch for it with those three products. added dro’s to the lathe cross slide and saddle the small one came from banggood the long one off ebay, look like the same units. also found these 2 screws loose they hold the nut for the cross slide .may explain some inaccuracy I have been having (perhaps cuased from milling? )routine maintenance I guess. You won’t know yourself with the dro. Nice mod. Nice! A DRO on both axis. I only have one. Not a mod but an unusual request, I had a work mate ask me to buff up his darts. Using the lathe also made it easier to straighten the bent ones. Here are some before and after shots. So by the end I figured all I was doing was cleaning his sticky finger jam off It was a fun little project that didn’t take much time. I started this a couple weeks ago but didn’t have an 8mm tapper so only finished it this weekend. On my drill press I ground back the mounting point for the depth gauge so it’s flat across the top. I didn’t get a before shot but it was an awful angle that point loaded the nut. I also added another guide/aligning screw to give it some rigidity and spin true. I wouldn’t say it is perfect now but it’s much better than it was. Whats the two threaded bolts in the main housing for? That’s the guide/aligning screws (sorry I don’t know the proper terminology). You can see a groove in the spindle shaft (above the chuck when it’s extended down), these screws stop the shaft from rattling around in the main housing. Other (more expensive drills…. yes I cheaped out…..again), have a bolt that clamps the housing around the shaft. This model relied on one screw pushing into the shaft. Now it’s got 2.